Bitcoin had an incredible run in 2017, but in one respect the coin is worse off than it was at the beginning of the year. Its share of the cryptocurrency market has more than halved since January 2017. 2017 was an incredible year for bitcoin. In addition to appreciating by more than 1,500% since the start of the year, it also now has two futures markets, which have lured numerous traditional Wall Street players into the nascent digital coin space. Still, in one respect the coin is far worse off now than it was at the start of 2017. 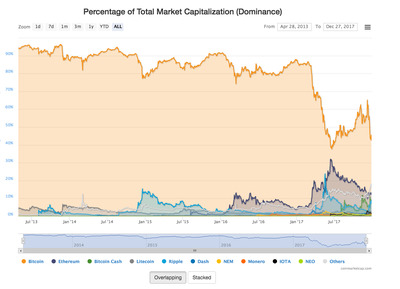 At the beginning of the year bitcoin commanded nearly 90% of the cryptocurrency market, according to data from CoinMarketCap.com. That number fell off a cliff in March, after which it shortly rebounded as bitcoin soared to eye-popping new highs. That number started to decline again in early December, reaching a low of 42% on Monday. It’s a similar story for Ethereum. For some time it looked as if it could take over bitcoin’s No. 1 spot. Its share of the market has fallen from about 32% in June to near 13% on Wednesday.